Migrants rescued from an inflatable raft. Public Domain photo by the U.S Navy. Aware Migrants  is a social media campaign that aims at informing migrants from 15 African countries  about the dangers of migrating across the Sahara desert, Libya and the Mediterranean Sea. For years, thousands of migrants and refugees from Africa and Middle East have been trying to cross the Mediterranean into Europe to escape poverty and political persecution. The project  is organised by the International Organization for Migration  (IOM), with the technical and creative support of Horace  communication agency, and financed by the Italian Ministry of Interior , Department of Civil Liberties and Immigration. IOM reported last March 10, 2017 that 19,567 migrants arrived by sea to Italy but 521 have died at sea, which is 50 more compared to the same period in 2016. Majority of the migrants were from Ivory Coast, Nigeria, Guinea, Senegal and Gambia. 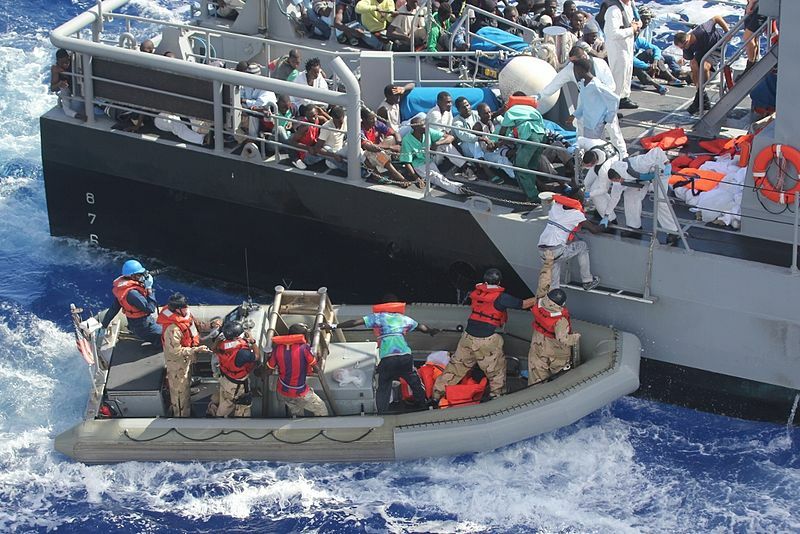 Many are unaware of the dangers and risks of migrating with the assistance of smugglers, not only at sea or in the desert, but also in transit countries like Libya. Recalling the life-threatening risks along their journey is often very distressing and in many instances, most migrants wish to forget and move forward with their lives and therefore tend not to share their experience with peers who are still back home. The campaign uses Facebook , YouTube , Instagram  and Twitter  to provide social media platforms for migrants to exchange opinions and testimonies through pictures and videos gathered throughout the journey.